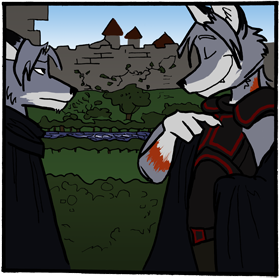 Crimson Flag is a fantasy furry action/adventure (semi-) medieval-themed webcomic about two races of anthropomorphic foxes that don't quite get along. The Red Reyn (red foxes) conquered Reynland long ago, and the Grays (gray foxes) found themselves owing fidelity to a crown no longer their own. Regardless, peace followed for many a year after the long war. Until of course, someone had a brilliant plan. 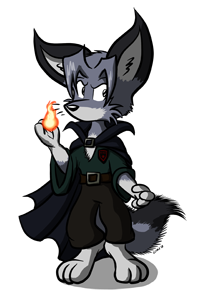 Other races inhabit the world of Vandairia as well, including the technical-minded Snows (arctic foxes), the shamanistic, nature-tuned, and occasionally thieving Swifts (swift foxes), and the desert-faring, large-eared Fens (fennec foxes). Don't forget dragons, wyverns, and the demonic rodent-things. Magic powers the world and ships fly in the sky. Crimson Flag came to me in 2006 as a random thought after reading a few good comics and stories on the net. The idea shifted through several forms, ranging from a silly story resembling a Saturday morning cartoon, to a dark, brooding adventure. I'd like to think the comic today retains elements of both. Though I practiced drawing for a few years, free time (and skill) constraints convinced me to seek help when the time came to get the ball rolling in 2008. The original pencil sketches of pages 1-116 were provided by Tod Wills, while I handled the script and coloring. In November 2010, I felt confident enough in my artistic capabilities to try drawing a few pages on my own. Pleased with the results, I decided to continue the comic by myself. My style is a lot cutesier than Tod's, so the style-shift at page 117 may be a little jarring. Sorry about that! But this is honestly more towards the style I originaly envisioned the comic in, and I'm very excited to be able to translate the images in my mind directly to paper. Hope you enjoy! Action and adventure awaits! Also, explosions.